• Multipurpose towels, hemmed edges. • For home & commercial use. Flour sacks are not really sacks at all, but sheets of fabric made of very thin cotton threads. The cotton was quite fine and had a special weave, which increase the surface area that gives this fabric a drying superpower. Flour Sacks have many uses in the kitchen because they are lint-free and safe to use around food. Since Flour Sack Towels are super soft, completely lint-free, absorb like paper towels, and dry faster than normal kitchen towels, they add unsurpassed sparkle to dishes, glassware, and windows. Even better, they make superb dusting cloths because they leave no lint behind! You can use them as alternative cheesecloth or for when you need a cloth strainer for recipes. You can also wrap warm rolls in them to keep them warm. You can use these towels again and again. VALUE PACK - The 12-Pack provides you with ample flour sack towels for all your household needs for today, tomorrow; and the future! With the perfect size of 24 x 25 Inches, anyone can handle these towels with ease! Read what our customers have to say! LONG-LASTING MATERIAL - Manufactured using 100% Pure Ring Spun Cotton, and knitted in a diagonal fashion, the soft and absorbent fabric makes these towels quick drying, and highly absorbent, and high quality. 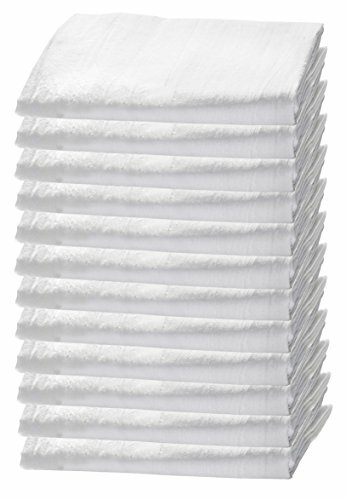 MACHINE WASHABLE - Easily washable, the towels maintain an excellent quality even after multiple washes! Will resist shrinking and minimize lint. Use these towels over and over again! This also helps reduce use of paper towels! Washing your towels before using them for the first time will help set the color, improve absorbency and reduce lint. If you have any questions about this product by HomeLabels, contact us by completing and submitting the form below. If you are looking for a specif part number, please include it with your message.